I loved my stay at this hostel. I've been to many different hostels and this I was definetely among the best ones. What really makes the hostel unique is the great atmosphere and vibe that the hostel staff creates. I felt so at home right from the start and still miss the place. If you want to meet a lot of great people this is the place to be! Honestly the best hostel i've stayed in! The staff is amazing and everyone there was so Nice! There's a Free dinner every night Which really gets the entire hostel together. After that everyone has a drink together and then in the evening there's the opurtunity to go out with everyone. The ambiance is amazing and the facilities were great. I'd Totally recommend this hostel to everyone, especially single travellers. Location is great too. Just book it, you'll have a great time! Very nice hostel. The staff gladly tells you what kind of things you have to do in the city and is really friendly. They have this free dinner every night for all the guests. That's nice because you have free dinner and can make new friends during your travel. The dorms are not that clean though. On the side of my bed against the wall were hairs and old crisps. Besides that it was really good! Will come back. I would really recommend this hostel. The location was perfect and a metro station was also around the corner. The staff was nice and there were cleaning ladies walking around all the time. The kitchen was a great place to meet new people, if you want to. De sfeer van dit hostel is fantastisch: als solo-reiziger ontmoet je snel anderen en elke avond is er wel wat te doen. De bedden zijn helaas minder: dunne matrassen, weinig ruimte om spullen op te bergen. Nice hostel! Perfect location. Big kitchen with dinner at 8pm, drinking games at 9:30pm and oppurtunity to party at 11pm. So after 11 it's quite quiet.. And joining is a lot of fun! It is really easy to make friends and there's a good atmosphere. Also a big common room with a place to lie down and a big couch and TV. There are enough bathrooms (except just after dinner), but there are no seperated toilets and it's not always clean. The beds could be more comfortable, but I enjoyed my stay!! 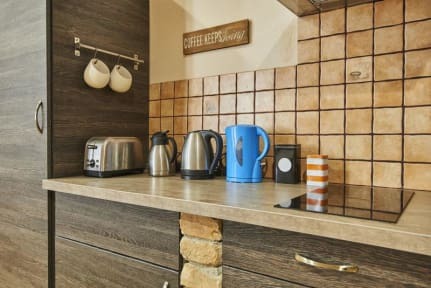 Nice and cosy hostel with big kitchen and rooms. Would definitely recommend! The hostel itself and the facilities are nice, but I came in winter so there were not too many people to hang out with. Futhermore it was not as clean as other hostels I stayed in, and when it is a little noisy you can hear it very well in the rooms.